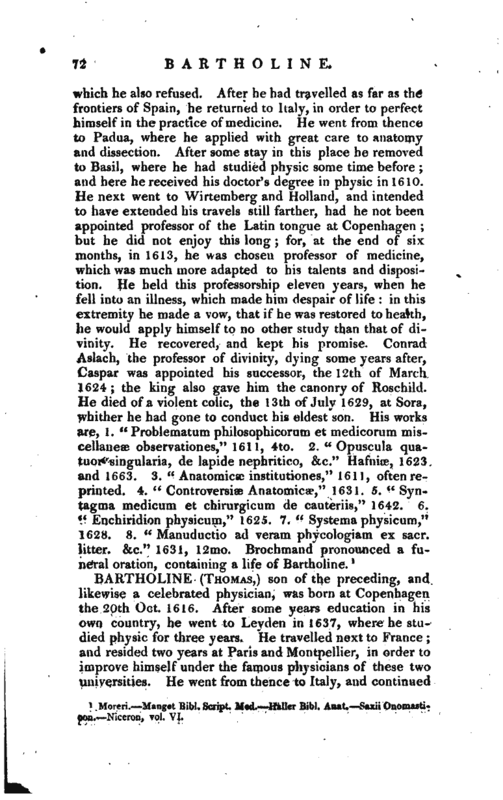 , son of the preceding, and likewise a celebrated physician, was born at Copenhagen the 20th Oct. 1616. 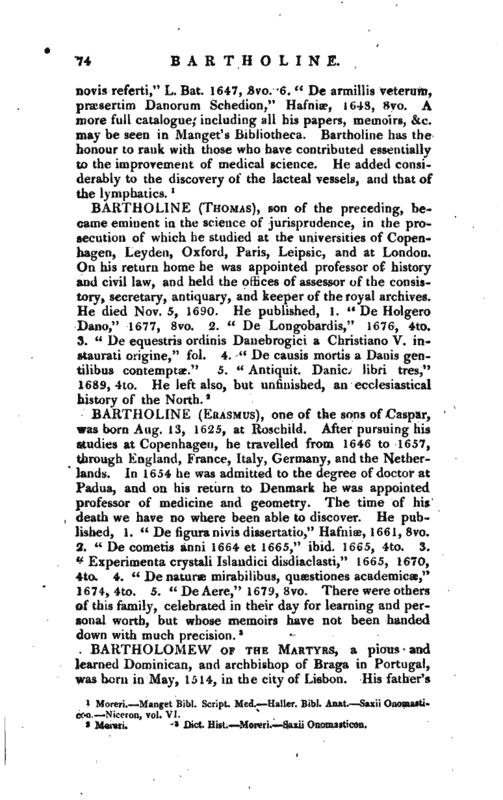 After some years education in his pwn country, he went to Leydcn in 1637, where he studied physic for three years. He travelled next to France; and resided two years at Paris and Montpellier, in order to improve himself under the famous physicians of these two universities. He went from thence to Italy, and continued | three years at Padua, where he was treated with great honour and respect, and was made a member of the IncogiutL by John Francis Loredan. After having visited most parts of Italy, he went to Malta, from that to Padua, and then to Basil, where he received his doctor’s degree in physic, the 14th of Oct. 1645. 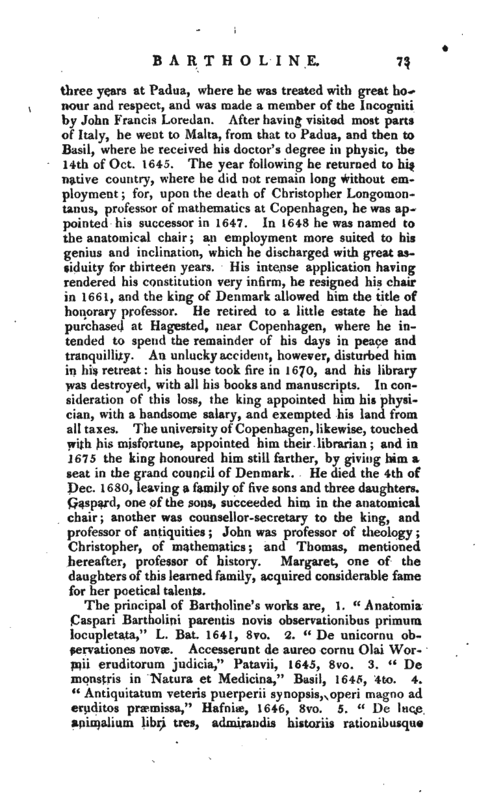 The year following he returned to his native country, where he did not remain long without employment; for, upon the death of Christopher Longomontan us, professor of mathematics at Copenhagen, he was appointed his successor in 1647. In 1648 he was named to the anatomical chair; an employment more suited to his genius and inclination, which he discharged with great assiduity for thirteen years. His intense application having rendered his constitution very infirm, he resigned his chair in 1661, and the king of Denmark allowed him the title of honorary professor. He retired to a little estate he had purchased at Hagested, near Copenhagen, where he intended to spend the remainder of his days in peace and tranquillity. An unlucky accident, however, disturbed him in his retreat: his house took fire in 1670, and his library was destroyed, with all his books and manuscripts. In consideration of this loss, the king appointed him his physician, with a handsome salary, and exempted his land from all taxes. The university of Copenhagen, likewise, touched with his misfortune, appointed him their librarian; and in 1675 the king honoured him still farther, by giving him a seat in the grand council of Denmark. He died the 4th of Pec. 1680, leaving a family of five sons and three daughters. Gaspard, one of the sons, succeeded him in the anatomical chair; another was counsellor-secretary to the king, and professor of antiquities; John was professor of theology; Christopher, of mathematics; and Thomas, mentioned hereafter, professor of history. Margaret, one of the daughters of this learned family, acquired considerable fame for her poetical talents. Moreri. —Manget Eibl. Script. Med. —Haller. Bibl. Anat. —Saxii Onomasticon. Niccron, vol. VI.